SYNOPSIS: Executive Producer Steven Spielberg delivers the ultimate race-against-time thriller that will keep you on the edge of your seat! 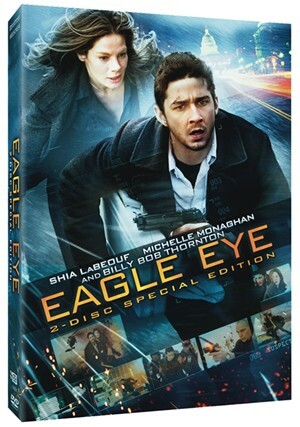 Shia LaBeouf (Transformers) and Michelle Monaghan (Mission: Impossible III) star as strangers ripped from their ordinary lives when they are “activated” as part or a high-tech assassination plot. Through blistering chases and shocking twists they try to escape – but where do you go when the enemy is everywhere? REVIEW: “You’ve been activated.” If you get a strange call from a strange person (most likely a female) telling you these three words, consider yourself no longer in control of your life. You are now her puppet and are forced to do as she says or you will face inconceivable consequences. Who is she? What does she want? Why me? These questions will be answered through the course of this incredible roller coaster ride of a movie. I thought the fun, action packed summertime movies were over. I guess not because this one can play up there with the big boys of this summer. It was an intense, pressure-filled, edge-of-your-seat thriller. There is a lot of negativity surrounding this film and I don’t understand why. Allow me to briefly give my disclaimer once again. I am a fan of movies. I enjoy watching movies as an escape from reality by being entertained, moved, inspired, AND/OR impressed. It can be all of those or any one of those or even something that I might be forgetting to mention. Bottom line is that this movie did at least one of those for me; it entertained me quite successfully. I wasn’t alone either. I was fortunate to have two of my Smartcine partners with me, who happen to also be my cousins, Luis and Mady Gars. I can tell you that Mady is one to quickly criticize this type of movie. Well I am very happy to inform you that the three of us concurred on the overall rating. This might be a first for us, or at most a second. The surrounding audience seemed to concur as well because there was plenty of ohs and ahs, gasping, cheering, screaming, and applauding throughout the presentation. Sure there is plenty that one could criticize about this movie, but then again there is always something that someone could criticize about any movie. My goal is to give you reasons to go see it as opposed to giving you a lot of negativity. Sorry for rambling on about this, but this movie is a perfect example of why my score is so different from many others. So in summary, was the movie entertaining? Most definitely. Does it have a good cast and did they perform well? With currently hot stars Shia LaBeouf and Michelle Monaghan taking the lead and giving chilling performances along with supporting stars Billy Bob Thornton and Rosario Dawson showing us why they’ve earned the respect they have in the cinematic world, I would say the answer is a resounding yes. In addition to their performances, the script they had to work with was truly exceptional. The dialogue was full of sarcasm and dry humor as well as being sharp, direct, and precise. There was no beating around the bush here because there was no time for it. Even the lady on the phone was so precise that she almost sounded mechanical. But was the storyline any good? Well, okay, I’ll admit the story was a bit cliché, especially toward the end, using a well known concept but at least it had a slightly different angle and I don’t think it devalued the overall picture. The cinematography and special effects were well done with the exception that many times the action was blurry and difficult to follow. The climax of this movie was unique to say the least . . . far fetched but unique. I could easily compare this movie to a few others but doing that alone could be a plot spoiler so I won’t do it. Credit should be given to Director D.J. Caruso for raising his bar. He has had good output with projects like Taking Lives, Two for the Money, and Disturbia. I think he outdid himself with this one. Movie fans, the summertime action flicks are not over yet. Here is another good one to see. DVD: The 2 Disc Special Edition includes about 70 minutes of special features. Most of the special features in this edition, take viewers beyond the making of the film. However the only feature that is worth watching is "Asymmetrical Warfare: The Making of Eagle Eye Documentary", which is a good 26 minutes documentary about the film production. It also includes three deleted scenes and a short alternate ending. See below for a full description of the Special features for this DVD.